WASHINGTON. 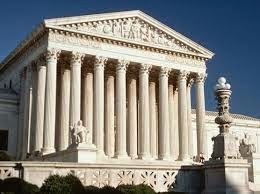 D.C. — The U.S. Supreme Court today dealt a serious blow to the gun lobby, ruling against a challenge to federal law which forbids misrepresenting the identity of the actual gun buyer or so-called straw man gun purchase. In Bruce James Abramski, Jr., Petitioner V. United States, the court affirmed, in a 5 to 4 decision, the conviction of Ambramski of knowingly making false statements “with respect to any fact material to the lawfulness of the sale” of a gun. The Gun Control Act of 1968, 18 U. S. C. §921 e, seeks to prevent the transfer of firearms to people not legally entitled to purchase or possess any firearm. The Court ruled that Abramski’s false statement prevented the dealer from insisting that the true buyer appear in person, provide photo identification, and submit to a background check. Abramski, a former Virginia law enforcement officer, was purchasing a gun from a licensed gun dealer with the intent to give the gun to a family member. The federal background check asks if the buyer is the “actual transferee/buyer” of the gun. Abramski was charged with lying when he answered in the affirmative on the form.